With globalization of economy and increase of global competition to acquire rare resources, the organizations have moved towards geographical distribution to achieve competitive advantage. Users and project teams at various places within various countries with different national and local cultures throughout the world work on projects at the environment concerning geographical distribution. On the other hand, with increase of advancements in communication, the distributed project teams have been witnessed with more expansion, known with “virtual teams”. When members of virtual project team from various organizations and time zones attend in the projects, they will be more likely affiliated to electronic media such as email. With regard to virtualization of IT projects, the present study aims to develop a model for virtual project management with an emphasis on information technology projects, including several elements in geographically distributed environments. The final model of virtual project management of information technology projects was represented. Advancements in information technology together with rapid growth of internet have led to development of globalization. These advancements have caused failure of time and geographical barriers to the organizations which seek business and economic growth (Guillen, 2001). Progressive realization of world economy has led to increase of interaction and cohesion of economic systems which generally do not enable to coexist due to time and place limitations. As the result of increasing interactions in these systems, most of organizations have developed flexible and dynamic structures which can be immediately adjusted with customers’ needs (Jarvenpaa & Leidner, 1994). Information technology plays a major role in this transfer, which emerges as an enabler in new organizational form. Currently, information technology which has been considered as a substantial element in organizational processes has infiltrated most organizations, emerging in the global work teams (Armin. B. Cremers et al, 2005). Emergence and use of work teams have caused a substantial change at work environment. Global work teams which rely on information technology for their interactions are recognized as virtual teams. Through virtual teams, organizations enable to share experts’ and personnel’s skills and knowledge beyond time and place barriers. Project managers might be at a position enabling to select the best resources for their project at any place (Goiuld, 2004). Virtual teams might be distributed at building, region and/or countries. In point of view of Gold (2005), virtual teams imply the teams from individuals who firstly interact with each other through electronic devices, but they might need face-to-face sessions later. Anyhow, the team members might never have a face-to-face interaction among the geographically distributed organizations. In general, it can define the virtual teams as a group of individuals who work in the same projects but in more than one workplace, and severly adhere to information and communication technologies (Guido Hertel, 2005). Enviornmental changes have taught the organizations to search for the best resources around the world for the purpose of acquiring the competitive advantage (Canie L. et al, 2004). Mergers and acquisitions, emerging markets in different geographic locations, needing to reduction of cost, needing to reduction of time to enter into the market, and production cycle time are the reasons which justify the need to virtual teams. Today, virtual project teams have become an integral part of management forms, and the organizations are required ensuring achievement of project goals concerning the new environment. Virtual project teams require organizing their team to the full extent of organizing in traditional teams. These teams have raised a new challenge for the project managers for delivery of high-quality products (Bruce J., Arolio G., 2002). Kenneth David Strong (2004) in a study at the area of leadership in the virtual environment has more likely strived to identify the leadership roles and behaviors. For this purpose, he has referred to the leadership components including common vision and electronic monitoring. 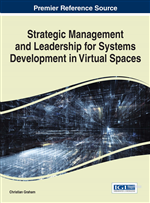 In his study, he has examined various types of behavioral leadership models concerning virtual teams. Hertdeller (2005) has proposed a model for life cycle of virtual teams, and also has pointed out elements of their life cycle by dividing the stages of virtual teams’ life cycle to various phases.